How Much Would a Brick of Gold Weigh and Cost? The cost would depend on the purity and weight of the brick or bar, multiplied by the spot price of pure gold. 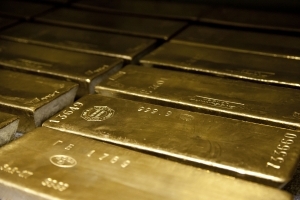 For all practical purposes and calculations, the commonly referred to “brick of gold” is the one held as gold reserves by central banks and those stored at Ft. Knox. The typical standard bar is the 400-troy-ounce Good Delivery gold bar weighing in at 27.4 lbs (12.4 kg or 438.9 ounces). Additionally, there is the kilobar (1000 grams) at 32.15 oz., which is easier to manage and thus more suited for trading and investing. Ten ounce and a small one troy ounce (31.1 grams) bar are also commonly produced. Naturally, these are less expensive overall because of the size. All of these bars may vary in purity but typically are .99 to .9999 pure. Sign up for the eNewsletter today!